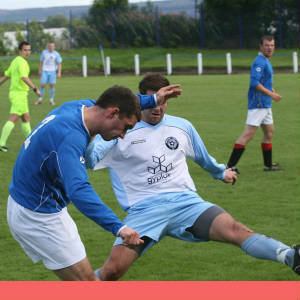 Penicuik travelled to Davie Park, Blairgowrie for the opening fixture in the 2010 League campaign. Penicuik created enough chances, particularly in the second half to win two games, but the goalless draw did not reflect the true nature of the game. In the second minute, Barrie got behind the Penicuik defence, but his poor cross hit the side netting. Minutes later, Brash should have done better for the home side when his effort went high over the bar. Penicuik got past the initial burst by Blairgowrie and in the 8th minute, Noon saw his shot saved by O’Brien at the second attempt. In Penicuik’s next attack, O’Brien beat away a Coleman shot and the rebound was deflected away for a corner kick. In the 24th minute, Blairgowrie attacked down the left and McLean left Gallagher for dead but his dangerous cross was headed away by Steel. Penicuik by now, had most of the possession, but were unable to turn it into positive effect with the Blairgowrie defence standing strong and keeper O’Brien well placed to save when called upon. Then, in the 39th minute, following two consecutive corners to Penicuik, O’Brien was twice at full stretch to clear the danger. Blairgowrie immediately broke quickly from defence and Bald pulled off the save of the game to deny Duncan and Gallagher got in a tackle to block the rebound by Cruikshank. Immediately afterwards, Penicuik attacked up the left and Noon set up Coleman, but his shot scraped past O’Brien’s left hand post. 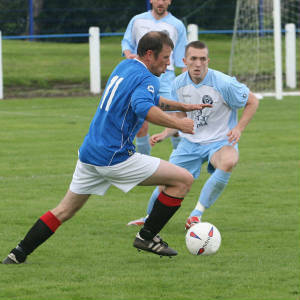 Penicuik started the second half on the attack and kept Blairgowrie under pressure. However, in the 54th minute, Blairgowrie again broke quickly from defence but McLean’s shot was well held by Bald. At the other end, O’Brien pulled off an excellent save to deny Walker. On the hour, following strong pressure by Penicuik, the visitors had two shots blocked and a third effort by Meikle was ballooned over the crossbar from ten yards. Next, an inch perfect pass by Barr picked out substitute Moonie but his strike also went over the bar. In the 68th minute, a lightning move by Penicuik from defence saw Barr set Moonie free on the left. He beat his man, cut the ball back to the edge of the box where Barr shot first time, but he dragged his shot wide of the post. The miss of the match came in the 72nd minute when Steel got round the back of the Blairgowrie defence to set up substitute Robertson, but he some how contrived to blast the ball over the bar from inside the six-yard box. Then Steel and Coleman combined well down the left only for O’Brien to save low down to his right. Two minutes later, Robertson only had O’Brien to beat, but again the keeper brought off another great one handed save. In a rare Blairgowrie attack, Brash was inches away from heading home a free kick that deceived everyone. In the 86th minute a curling free kick was headed inches past the Blairgowrie goal by Kelly. 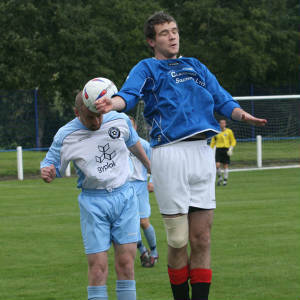 In injury time, with Penicuik pressing for the winner, a long high ball caught them out. Steel was left on his own to deal with two Blairgowrie attackers, and saved the day for the Cuikie with a tremendous last gasp tackle to clear the danger.